Discussion in 'NCAA (All Sports)' started by AJ_II, Oct 30, 2008. 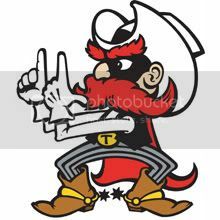 Some of you may know I'm a Texas Tech grad and a huge fan of Red Raider football. 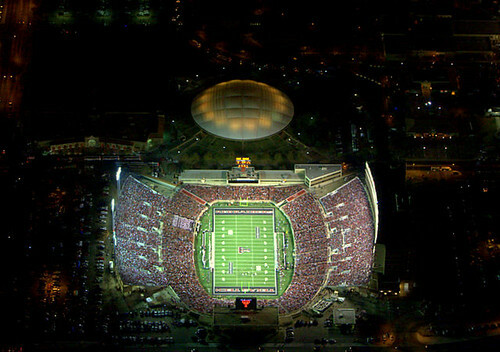 And I'll be at "The Jones" Saturday night to see probably the biggest game in Tech history when they take on #1 Texas. This week has dragged by so slowly, I just wish it was Saturday night already! I think the game could go either way, but if Tech plays like they did last week, I think they'll win the game. I just hope the defense shows up to play. As crazy as it sounds, I think if they can hold Texas to 31 or less, it'll be mission accomplished and Tech will probably win the game. The defense needs to get pressure on McCoy, cause at least one turnover, and give the offense all the possesions they can. I doubt you'll be seeing a lot of punts in this game. And I really, really hope the game doesn't come down to Tech needing a last second field goal to win or tie, because our kicking game is terrible. Can't wait for Saturday...hopefully we give those Longhorns a good game. Wreck 'Em Tech! Good luck to your Red Raiders. I can't wait to sit back drink a few and watch that game. I bet if they win they will shoot up to #1 or #2 atleast and they will deserve it. I've never really like the Longhorns, so Go Red Raiders!! Hopefully the scoreboard ends up lookin something like this at the end of the game...from '02, the last time we beat UT, and the best game I've ever been to. "The Jones" on Saturday night! Wes Welker was a Red Raider? I did not know that. How big is your stadium? Welker was our first short, white receiver at Tech under Leach. He then passed the torch to Danny Amendola, now Eric Morris fills that position. I'm sure they'll tell you on Saturday, but Morris is known as "The Elf" (he's 5'8''). The listed capacity of Jones AT&T Stadium is about 53,000. Not too big when you compare it to places like "The Big House", but it gets very, very loud in there. And they're going to pack the students in like sardines for Saturday night...I'm sure it'll be a record crowd, probably somehwere around 57,000. Kind of an old picture (probably 3-4 years) because you can tell the astroturf is still there...but other than that, this is a pretty good picture of the stadium. The press boxes/luxury suites in the foreground was built in 2003. Just another picture from the inside, with the updated field turf added in '06. I'll be sitting in the third section from the left, about halfway up (I think, if I'm judging this picture correctly). Lubbock is farther away from Houston than I thought. Quite a drive for you. Wikipedia says that further expansion of the stadium's East side will begin next year. Tell me about it...Texas is so freaking huge! Lubbock is exactly 500 miles away from where I live in Houston, or about 8 hours (though I've made it in 7 before). Sirius is my best friend on those road trips. Believe me, I've made that drive so many times going back to my college years, I know every rest stop on the way, every turn, every little town you have to go through (Rising Star, TX is my favorite). I'm leaving early tomorrow, sometime around noon, so I should get to LBK around 8 or 9. Luckily, I still have a few friends who live there so I don't have to worry about a hotel. I hear every single room in Lubbock is booked. Yeah, that new expansion you're talking about is going to get underway after this season. It's going to be a Spanish style of architecture just like the rest of the Tech campus. That stadium has seen a lot of drastic changes over the past 6 years or so, and it's only going to get better. Hopefully that'll help with the recruiting...it's not easy selling Houston kids on going all the way out to Lubbock when UT and A&M are right there. If your travels take you through Lampasas you can stop for the bext chicken fried steak ever? I drive 5000 miles a month in Carolina for work, God I miss Texas. Nope, don't go through Lampasas. It must not be on Highway 36. Too bad, I love chicken fried steak. This is why I love college football. See how passionate the fans are. Thats really cool. Congratulations Avuncular! Great game in Lubbock. I was getting worried there towards the end. Did you get to storm the field? I'll go out on a limb and guess that Michael Crabtree will never have to pick up a bar tab in Lubbock, EVER! Guys, I can't begin to describe what that game was like. I can say it was the best game I've ever seen, but even that's not giving it justice. I know I'm very biased in saying that since I'm a Tech grad/fan, but it's pretty difficult to name a more dramatic ending to a college football game of equal or greater magnitude. It was billed as the biggest game in Tech history, and it sure did live up to the hype. I'm so grateful my friend decided to sell me his tickets! And to answer Aaron's question, hell yes I rushed the field! I guess I had a flashback to '02 and got caught up in the excitement of it all. Although I was one of the few who actually waited for that last second to tick away. What an ubelievable game, something I'll never forget. And they get to do it all again next week. The game against Oklahoma State next week is on in primetime again on ABC, and Gameday might go back to Lubbock too. Might be time for another road trip on Friday. That game was incredible. I had goosebumps sitting at home watching it. I could only imagine being there. Congrats to your Red Raiders. They deserve that BCS ranking. The game against Oklahoma State next week is on in primetime again on ABC, and Gameday might go back to Lubbock too. Nope, Gameday is going to Baton Rouge for the Alabama/LSU game. Didn't think ESPN would go there since CBS is broadcasting that game.